See Something, Say Something with VTAlerts. Home>Getting Around>GTFS Info>See Something, Say Something with VTAlerts. Safety and security is of the utmost importance at VTA and we continually strive to find easy-to-use tools and new technologies to make our transit system safe for all of our passengers. At VTA, we know that you are sometimes the first to observe safety concerns, suspicious activities and medical emergencies. So, what can you do to help? VTA offers a mobile app for both the iPhone and Android smartphones, and the iPad. 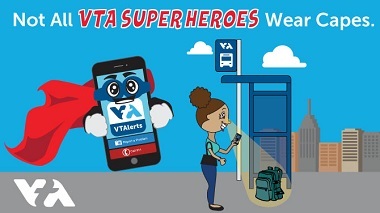 By downloading the FREE, VTAlerts app, you will have the ability to call 911 in the event of an emergency or instantaneously report safety concerns directly to VTA Transit Security when traveling on our system. The test function even allows you to try out the app prior to real-time submission. We encourage all riders to use this function immediately to get comfortable navigating the app. Together, we can make VTA Bus and Light Rail safer and more comfortable for all. The VTAlerts app is available on iPhone/iPad and Android devices or by searching "vtalerts” at your app store. If you do not own a smartphone, you can text-a-tip to (408) 610-1440.​ Please note: The VTAlerts app is not intended to replace 911 emergency services. In the event of an actual emergency, Call 911 for immediate assistance.